FARMERS PLACE, SOUTH EDMESTON, NY, won international recognition at the ‘DFV-AAMP Quality Competition for Sausage and Ham’, held Jan. 11-13, 2016, at the University of Wisconsin-Madison. The IFFA Quality Competition was the first event of its kind held in the United States. IFFA is the leading international trade fair for processing, packaging and sales in the meat industry, and hosts an international meat competition every three years in Frankfurt, Germany. The German Butchers’ Association (Deutscher Fleischer-Verban) formed a partnership with the American Association of Meat Processors (AAMP) to host the “satellite contest” in the U.S. The results from the U.S. competition will be included with those from Germany and acknowledged as being a part of the international show. - 24 Gold Medals: FRANKS, JALEPENO SNACK STICK, HOT SOPRESATTA, ANDOILLE SAUSAGE, SWEET SOPRESATTA, CHILI FRANKS, PATE SPECIAL, TRADITIONAL HAM, TURKEY HAM, APPLE HAM, BONE IN HAM, HOT SNACK STICK, HOT FRUIT SOPRESATTA, AGED12MONTH BONE IN HAME, SUGER CURED BACON, MUSCLE PRIME RIB JERKY, MUSCLE CRACKED PEPPER JERKY, HILLBILLY JERKY, BEEF BACON, PEPPERONI, PICKLED POLISH JAR, PEPPERONI SNACK STICK, HAM SALAD. - 5 Silver Medals: PEPPERONI, APPLE MAPLE BACON, GENOA SALAMI, COMMERCIAL HAM, RING BOLOGNA. - 12 Bronze Medals: BRAUNSWIEGER, COUNTRY HAM, BONE IN HAM, HONEY RING BOLOGNA, HONEY SNACK STICK, SUMMER SAUSAGE, SALAMI, FRANKS, BACON, JERKY. To make the event identical to the show in Frankfurt, organizers sent judges from Germany to conduct the competition. All entries were graded on appearance, consistency, smell, and taste. The competition received more than 300 entries from 15 states. FARMERS PLACE were invited by the German Butchers’ Association to attend a ceremony at the IFFA in Frankfurt on May 10, 2016, where they were awarded their certificates and medals and two GOLD CUPS, BEST IN HAM AND BEST OVERALL! Farmers Place is proud to represent Otsego County, New York State and the United States of America! 24 Gold Medals: FRANKS, JALEPENO SNACK STICK, HOT SOPRESATTA, ANDOILLE SAUSAGE, SWEET SOPRESATTA, CHILI FRANKS, PATE SPECIAL, TRADITIONAL HAM, TURKEY HAM, APPLE HAM, BONE IN HAM, HOT SNACK STICK, HOT FRUIT SOPRESATTA, AGED12MONTH BONE IN HAME, SUGER CURED BACON, MUSCLE PRIME RIB JERKY, MUSCLE CRACKED PEPPER JERKY, HILLBILLY JERKY, BEEF BACON, PEPPERONI, PICKLED POLISH JAR, PEPPERONI SNACK STICK, HAM SALAD. 5 Silver Medals: PEPPERONI, APPLE MAPLE BACON, GENOA SALAMI, COMMERCIAL HAM, RING BOLOGNA. 12 Bronze Medals: BRAUNSWIEGER, COUNTRY HAM, BONE IN HAM, HONEY RING BOLOGNA, HONEY SNACK STICK, SUMMER SAUSAGE, SALAMI, FRANKS, BACON, JERKY. 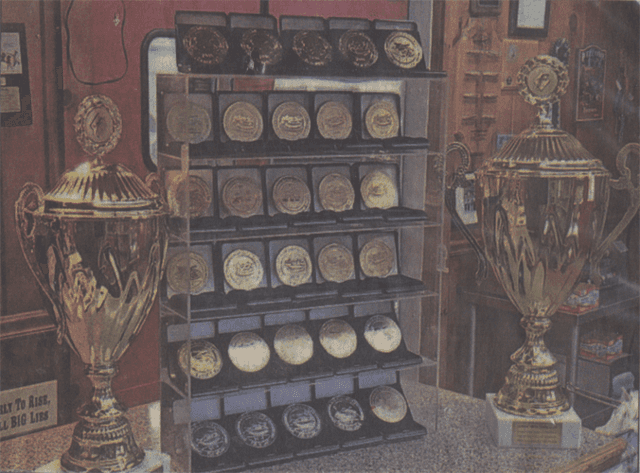 Farmers Place products competed with over 100 countries and 50 nations to win these medals and trophies!